The British pre-decimal halfpenny (​1⁄2d) coin, usually simply known as a halfpenny (pronounced /ˈheɪpəni/ HAY-pə-nee), historically occasionally also as the obol, was a unit of currency that equalled half of a penny or ​1⁄480 of a pound sterling. Originally the halfpenny was minted in copper, but after 1860 it was minted in bronze. It ceased to be legal tender in 1969, in the run-up to decimalisation. The halfpenny featured two different designs on its reverse during its years in circulation. From 1672 until 1936 the image of Britannia appeared on the reverse, and from 1937 onwards the image of the Golden Hind appeared. Like all British coinage, it bore the portrait of the monarch on the obverse. "Halfpenny" was colloquially written ha’penny, and "​1 1⁄2d" was spoken as "a penny ha’penny" /ə ˈpɛni ˈheɪpni/ or three ha'pence /θriː ˈheɪpəns/. Before Decimal Day in 1971 there were 240 pence in one pound sterling. Twelve pence made a shilling, and twenty shillings made a pound. Values less than a pound were usually written in terms of shillings and pence, e.g. 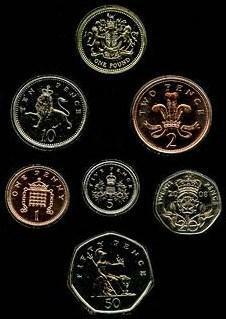 42 pence would be three shillings and six pence (3/6), pronounced "three and six", whereas 3 shillings even would be "3s" or, on a sign in a shop, "3/-" (the dash usually being written instead of 0 for pence). Values of less than a shilling were simply written in pence, e.g. eightpence would be 8d (the "d" standing for the Latin word denarii (sing. denarius, a common coin in Roman Britain) . ^ Albert Peel, Seconde parte of a register: being a calendar of manuscripts under that title (Cambridge, England: Cambridge University Press, 2010), p. 175, note. ^ "Halfpenny and Farthing". Royal Mint Museum. Retrieved 10 May 2014. ^ Michael, Thomas and Cuhaj, George S. Collecting World Coins: Circulating Issues 1901 - Present. Krause Publications, 2001. 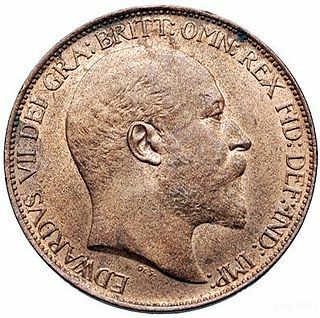 Wikimedia Commons has media related to Halfpenny.